apartamento para una pareja joven debido a las escaleras y diferentes detalles. La ubicación es perfecta y hemos estado muy a gusto. 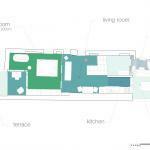 Very beautiful, comfortable, well located and nicely decorated apartment. 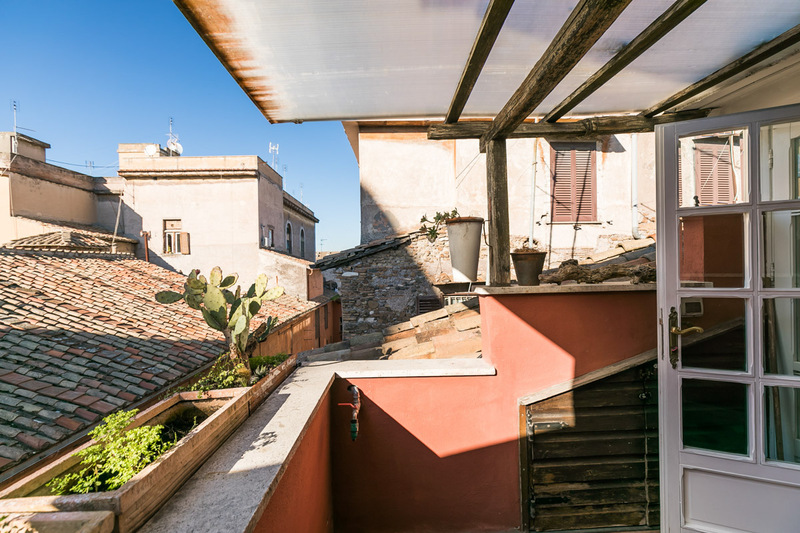 The two rooftop terraces are the cherry on the cake! Thank you for a lovely stay. Claudio was delightful and very helpful with his suggestions. Trastevere is my favourite place in Rome, it is everything you envision Rome to be. I will especially miss the lovely evenings there watching the festivities. The aircon in the unit was very welcome in the July heat and had everything you need. Lovely furnitured apartment. Small, but with great balcony for breakfast and an aperitive. 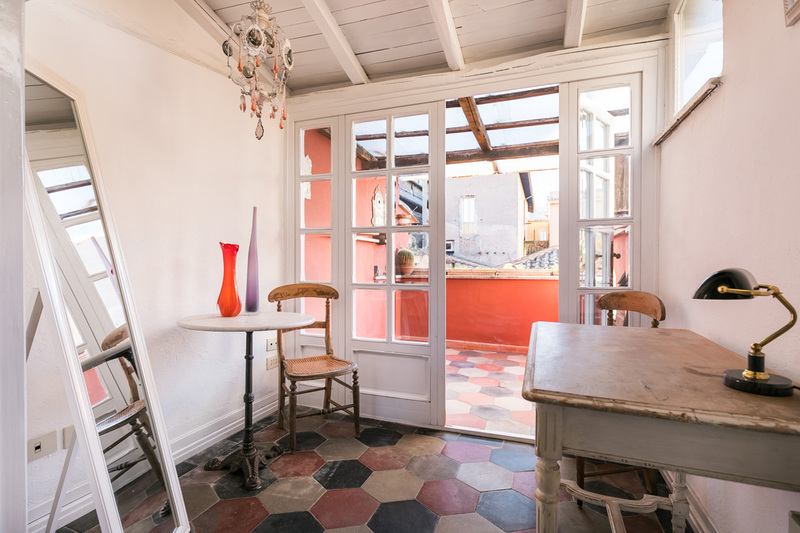 This is a lovely attractively renovated space, with lovely views of flower laden balconies and tiled roofs opposite. There are large well-organized closets in the bedroom, and lots of shelf space. It is quiet, and easy to sleep well. We very much enjoyed our stay, and would return in a flash. 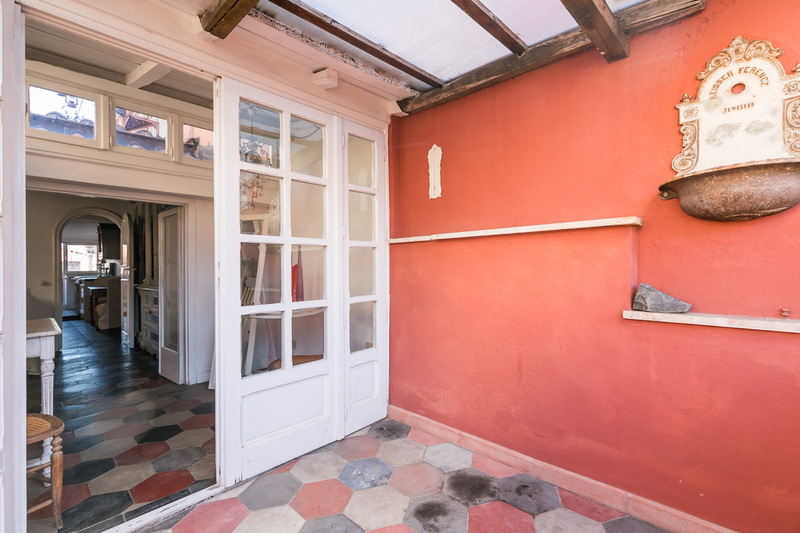 You will fall in love with this gorgeous, charming and sunny flat in Rome. 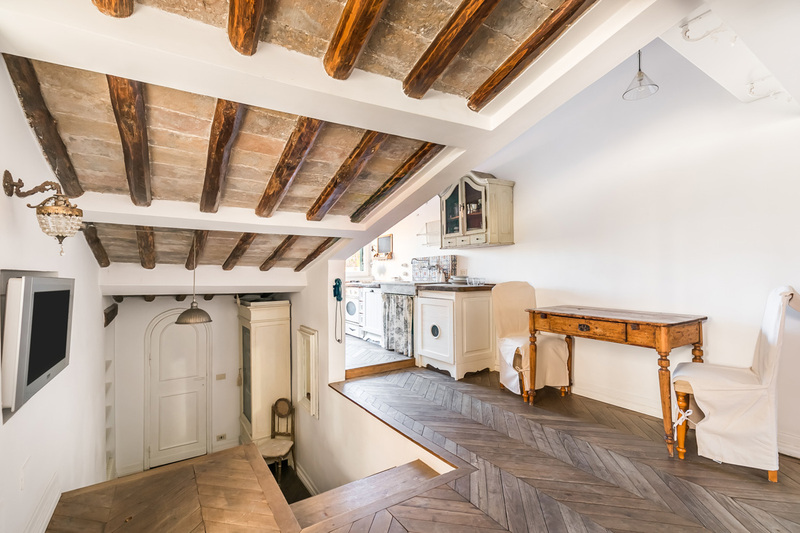 This delightfully warm attic apartment has not one, but two lovely terraces on Via della Scala. 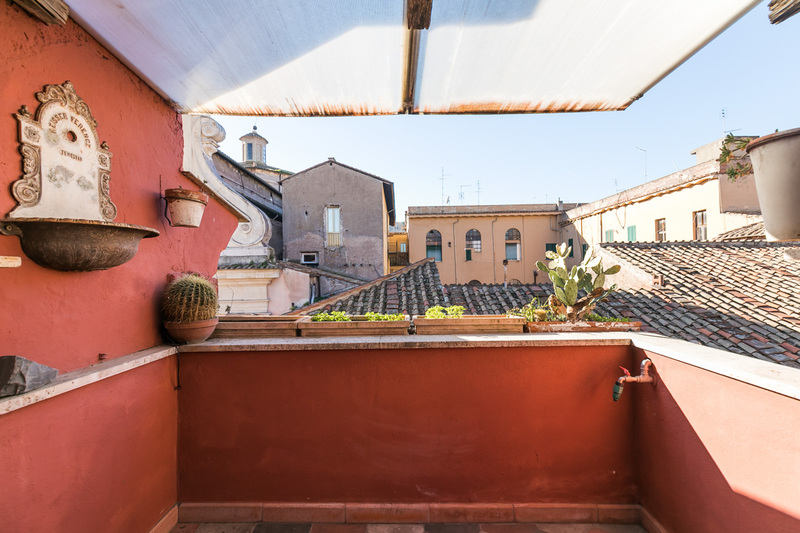 The apartment also boasts a wonderful view over the rooftops of Trastevere. You can find it in a recently-renovated building that still retains original feeling and integrity of the space. The master bedroom provides a king size bed. It also has a night table, abat-jour, mirror, and plenty of wardrobes. There is moreover a veranda with lovely outdoor furniture. In addition to this, you will find a bathroom with a shower. 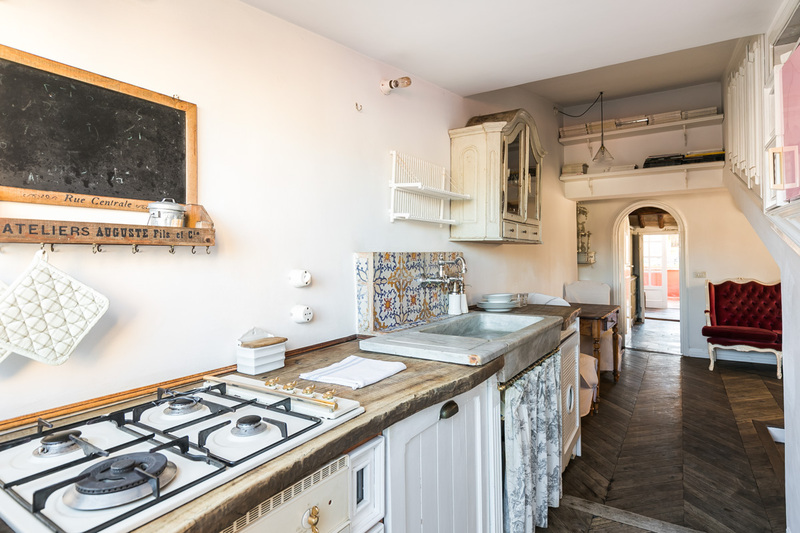 There is also a well-equipped kitchen, offering a gas stove, a fridge and a freezer. 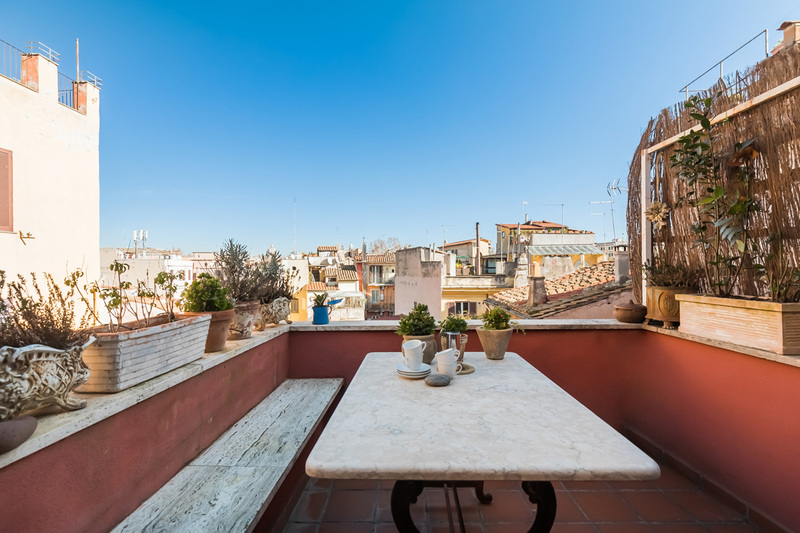 To top it off, 2 terraces overlook the charming Roman roofs and cupolas. You will furthermore have access to WiFi Internet and an air conditioning system. In the kitchen area you will also find a washing machine. Of course, it also offers facilities which will allow you to cook your own meals should you wish to remain in the comfort of your own home in the evenings. 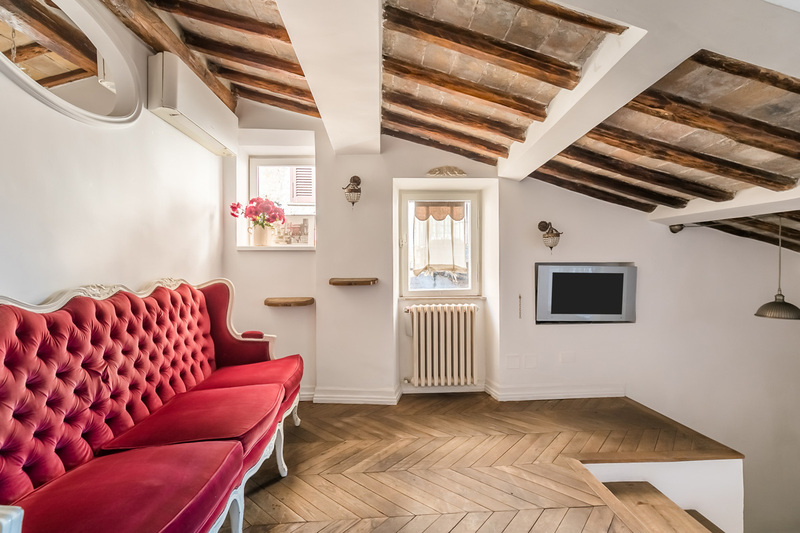 This delightful apartment will guarantee you and your group a lovely stay here in Rome. You can also enjoy its French style, particularly evident in the red velvet sofa for instance, and tasteful atmosphere. 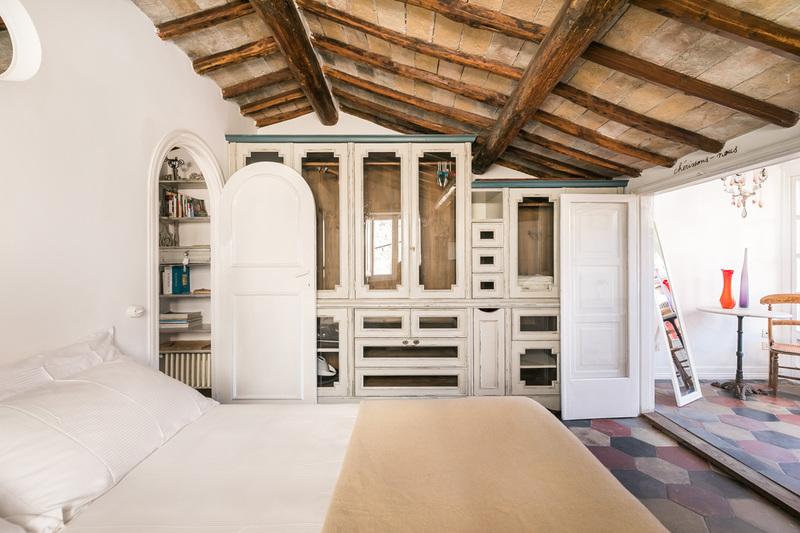 This apartment’s decorations create an elegant aesthetic, in which old and new harmoniously coexist. 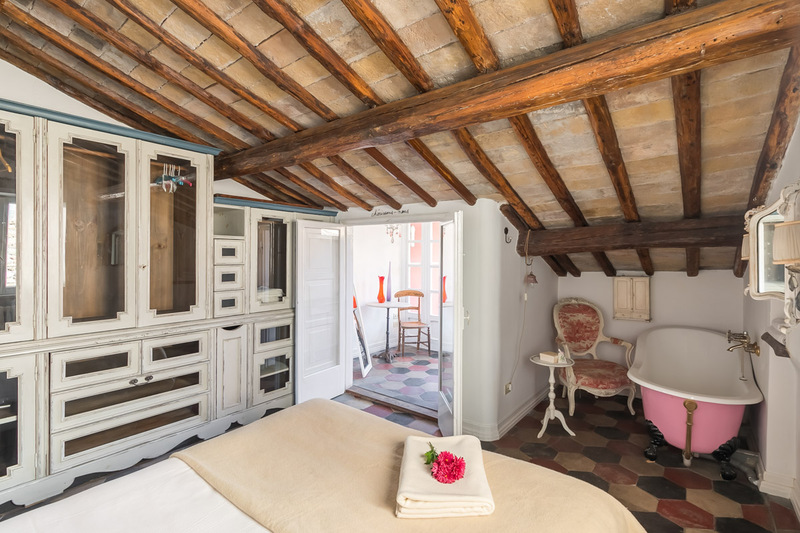 We highly recommend this unit to couples looking for a romantic stay. 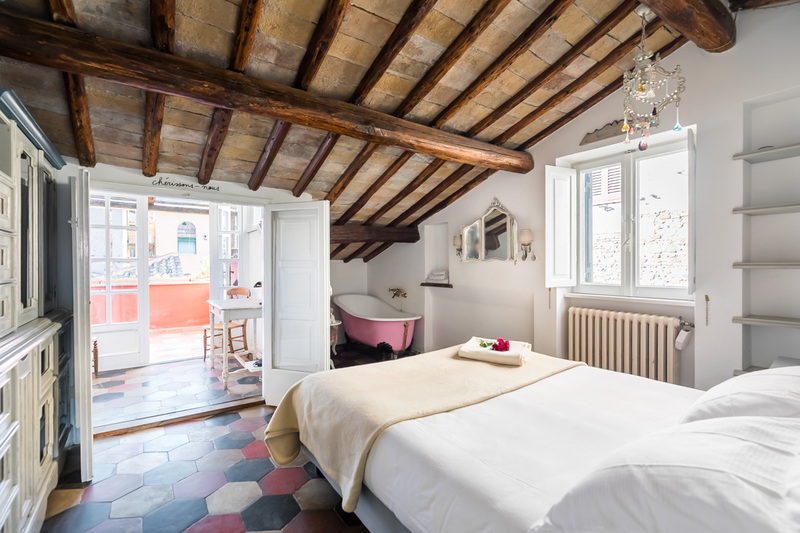 Also single travelers would enjoy this lovely pied-à-terre. Trastevere is a beautiful, charming part of Rome. Come evening, its characteristic cobbled streets fill up with people, spilling out of its quaint restaurants and bars. The atmosphere is a truly warm and friendly one, created by locals and tourists alike.Some of its most famous eateries include the bar Freni e Frizioni, and the pizzeria Dar Poeta. For a breathtaking sunset, head up the Gianicolo hill. 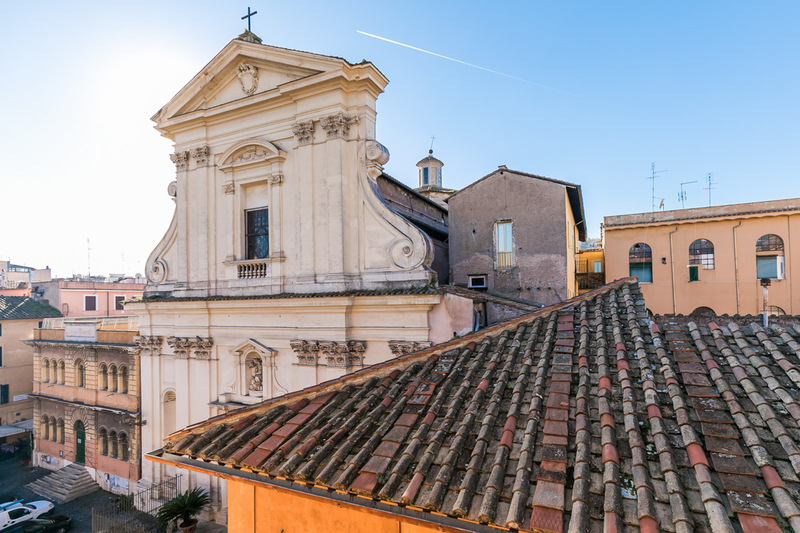 This sits just behind Trastevere, and gives onto the Dome of St Peter’s Basilica, making for an unforgettable sun down! To arrive in the middle of the historical center, simply cross the Ponte Sisto. You will then find yourself in the Campo de’ Fiori area. This piazza holds a daily morning market, where you can stock up on fresh produce to cook up a delicious meal at your apartment. Moreover, from here you will also be within easy walking distance of some great attractions. The Piazza Navona and the Pantheon are very close by. Alternatively, in the other direction you can arrive at the Castel Sant’Angelo and the Vatican on the other side of the river. Just a little further North will take you all the way to the Piazza del Popolo. Following the Via del Corso down from here, you will also pass the Spanish Steps and the Trevi Fountain, eventually arriving at the impressive Piazza Venezia with the Altare della Patria. I am full of praise for the service from RomeLoft, and the owner of the apartment. The apartment itself is in a great busy location in Trastavere, and we walked to every part of Rome, from the Vatican to the Collisseum, in minutes. There are dozens of local bars and restaurants, and the streets were busy every evening. The apartment is small but st...Read Moreylish, perhaps a little Bohemian, with shabby-chic furnishing and decoration, and we loved it. 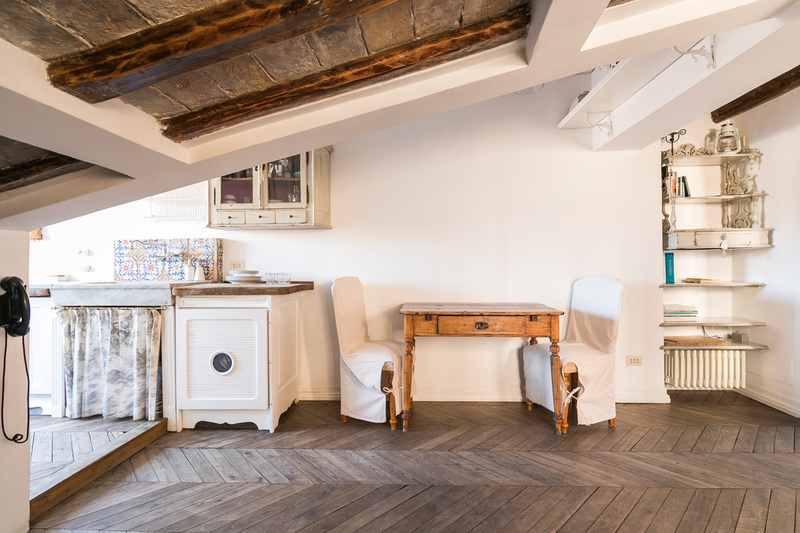 This is not the Rome Hilton, but an individual and characterful flat in a great location in Rome. 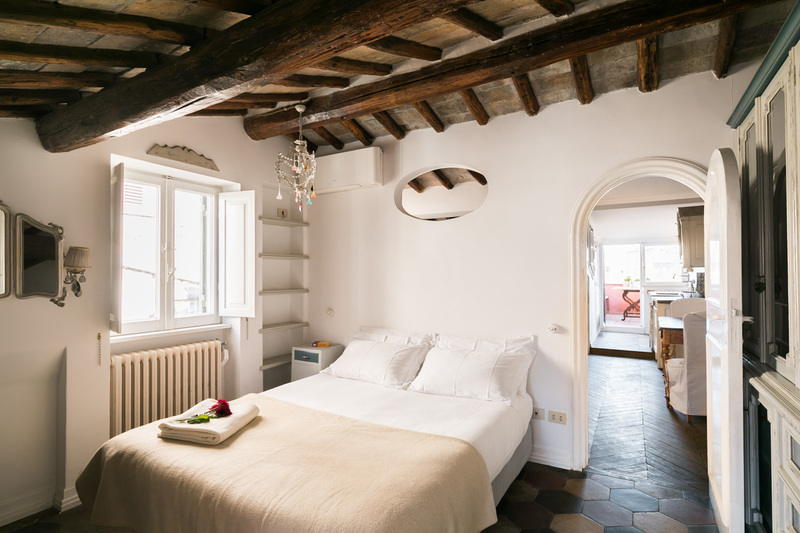 We would certainly stay there again, and highly recommend RomeLoft. Please be aware that tourists, especially men, from northern european countries or the US are differently built as for example french or italian men. Please understand my remarks under this commentary. The mattress in the bedroom is simply bad because too soft and of bad quality and leaves a very bad aftertaste considering the price of the rent....Read More Anybody who weighs more than 50 kg (>so 90% of all men) will probably suffer as I did. I had a vey hard time sleeping and woke up with a pain in the back everyday of our stay. The shower consist of two shower heads. One of them is built in at a height that every men over the seize of 1,85 meter does not fit under it. I had difficulties not to hurt myself when taking a shower. Please consider fixing that by making more room available. The apartment is a little smaller than it appears in the pictures but perfect for two and has a lovely feel. The terraces are fantastic and were the reason we booked this apartment. On the front terrace you can hear the buzz going on but have your own private drinks or nibbles before going out,very romantic ?? 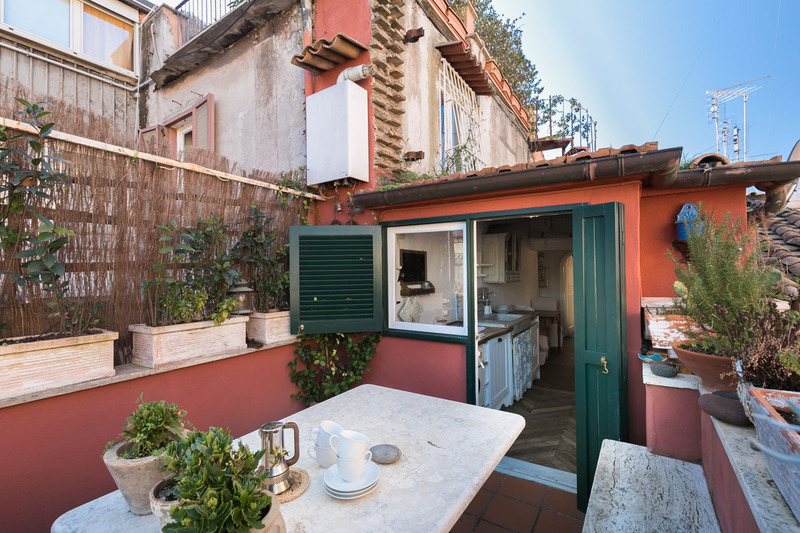 The back terrace is perfect for breakf...Read Moreast as it gets the sun from first thing in the morning. I felt the plants needed a bit of looking after so I gave them a water each day and would recommend the owners leave a note for guests to do this as it would enhance these areas greatly and there are hoses close by for watering. It would have been great if there had been some coffee milk and water there for our arrival but the mini market is just round the corner so we weren't too disappointed. Location is perfect and we walked all over with no need for taxis or busses. 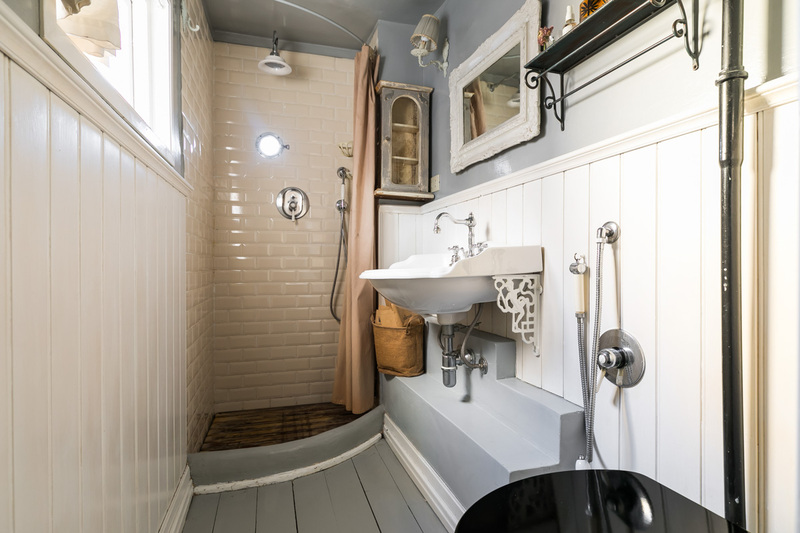 The bath wasn't plumbed in and we were told it was just for decoration which I was a bit disappointed with as after walking all day a good soak was just what I needed. The shower worked a treat though. I highly recommend using the transfere to and from the airport it was worth every penny and the guy who picked us up when we arrived was amazing and spoke 5 different languages giving us a running commentary on our way into Rome. Mr Honey was great and also spoke perfect English. We thoroughly enjoyed every minute of our stay and plan to return. 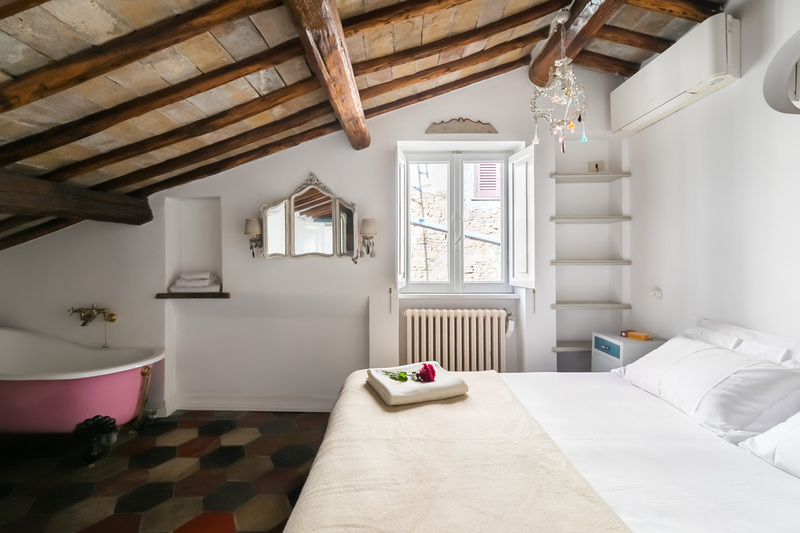 First and foremost, understand that Trastavere apartments are small and old. This apartment is small and old. Smaller and older than the pictures show. But it is quite charming and very "Trastavere"-like if you are into that area of Rome. You cannot beat this location at this value. You are one block from about 20 great restaurants. ...Read More You are 15 fifteen feet from 3 great restaurants. You are three blocks from markets, shops and a taxi stand where you can get a cab 24 hours a day. There are two terraces, which I think are a must in Rome. It also has a small fridge, reliable WiFi and a washer (no dryer). When in Rome, I don't spend much time in an apartment. This served the purposes of allowing my wife and I to be able to go out at night and eat and drink wine and then stumble home 20 feet away. I cannot emphasize how important that is if you are into the Trastavere scene. You lose soooooo much time cabbing or bussing around. And you lose motivation to go find new places when you are tired from walking 10 miles up and down all day. This area has everything, so you can experience so much of Rome without going more than a mile from your apartment. If you can afford a bigger, nicer place, go for it, but they are very expensive in this area. 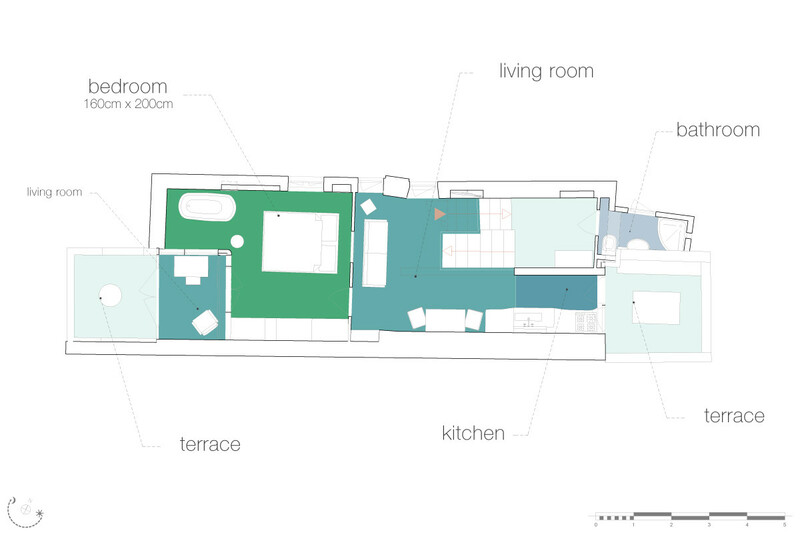 There just aren't a lot of real big apartments in Trastavere. This was our first time in Rome. 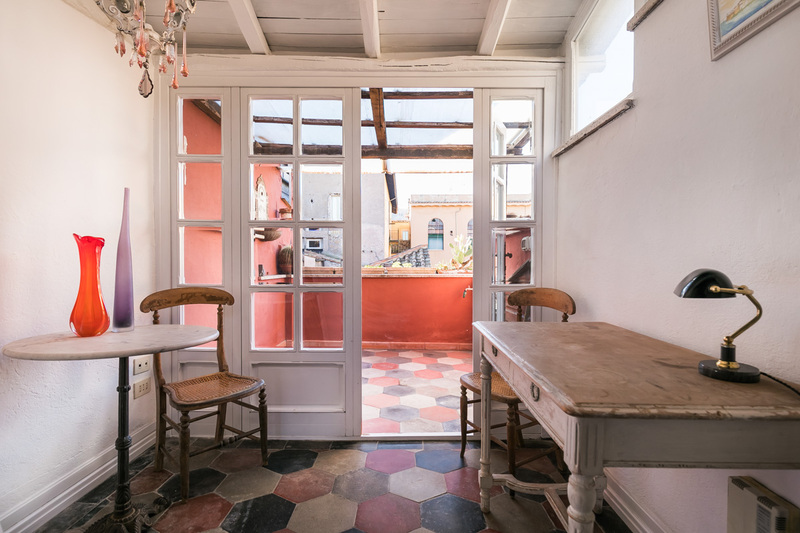 I'm so glad we chose Trastevere - and this apartment. The owner met us timely upon arrival, and was very helpful with details about the rental; even guided us to a very nice restaurant around the corner afterwards. The place was very well appointed and clean. Everything worked as expected (Wifi, good water pres...Read Moresure and A/C). Very quiet at night, slept very well. 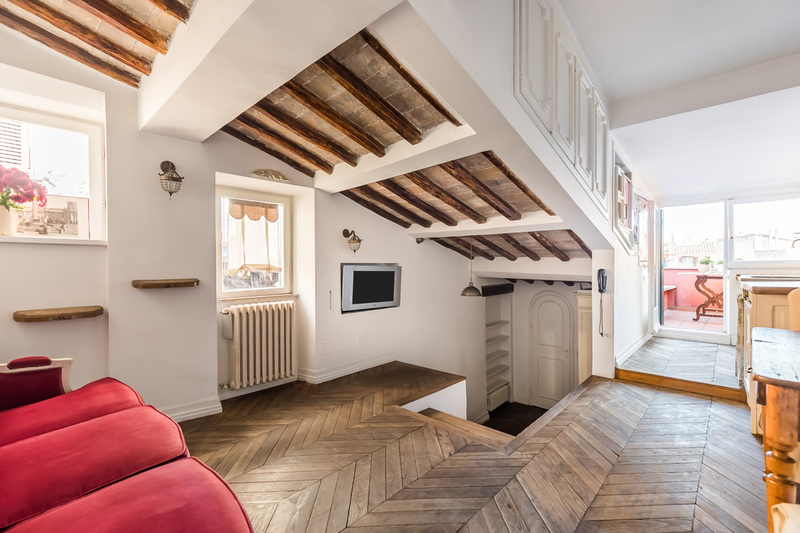 There are two terraces; we used the one facing opposite Via della Scala, as the other one did not have furniture - but that was OK. 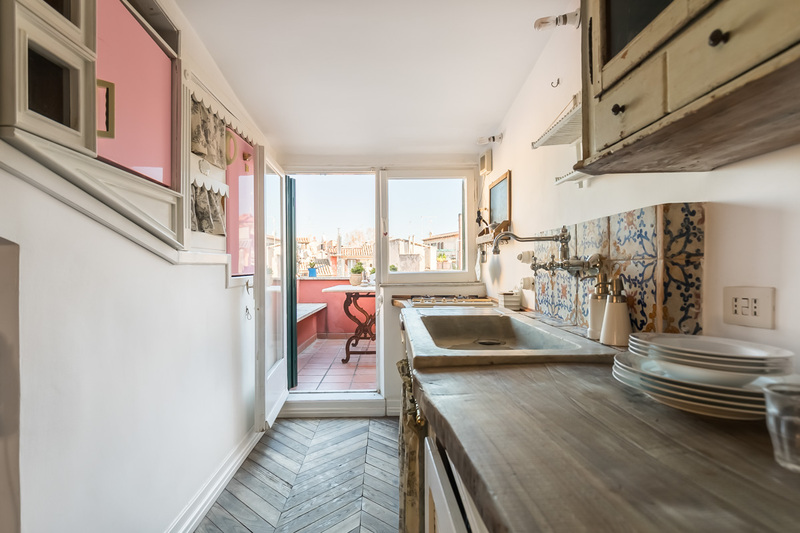 The location is perfect, safe, and with restaurants nearby in every direction; 15-20 minute walk to the Pantheon, and other attractions across the Tiber. Highly recommended.